Littorella americana occurs in the northeastern United States and adjacent Canada, and is considered vulnerable or imperiled across much of its range due to its rarity and threats to its habitat. It currently reaches the westernmost extent of its distribution in the Laurentian Mixed Forest Province of northeastern Minnesota. The species was first collected in the state by J. C. Arthur, L.H. Bailey, and E. Holway on July 28, 1886 from Basswood Lake in Lake County. Since that time, 60 some additional occurrences have been documented in the state. In the 1980s, the late Dr. Paul H. Monson of the Olga Lakela Herbarium at the University of Minnesota Duluth spearheaded efforts in documenting this aquatic species in northeastern Minnesota. His efforts with mask and snorkel resulted in the discovery of new populations, but more importantly, he generated renewed interest in L. americana and provided others with the field skills necessary to recognize this species from a host of associated look-a-likes. Survey efforts, particularly those ongoing in the Border Lakes subsection, are continuing to document new occurrences of this species. 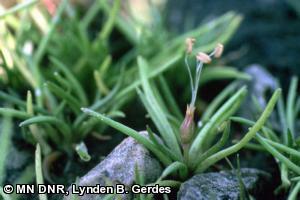 Littorella americana is a small aquatic plant. The rosettes have stiffly spreading, terete leaves that taper from mid-leaf to the apex. Plants are monoecious, having separate male and female flowers on the same plant. Staminate flowers have 4 sepals and rise from the base of the plant on pedicels up to 4.0 cm (1.6 in.) long. The male flowers have 4 stamens that occur at the ends of long exerted filaments. Female flowers are not so obvious. They are sessile and also occur at the base of the plant. Close examination is required to reveal the long stigmatic style of the female flower. Plants are stoloniferous and rhizomatous, often forming colonies. Plants only flower when they become exposed by lowering water levels. Littorella americana is an aquatic plant primarily occurring in lakes having a sandy, gravel/cobble substrate. In some lakes, plants may become partially or wholly buried in fine organics or silts. Plants are most often observed when they become stranded along the lake shore and in waters up to 61-91 cm (2-3 ft.) deep. The species may occur in deeper water, but is rarely documented there. At depth, plants are more difficult to see and require excellent survey conditions or underwater efforts with mask and snorkel. Littorella americana is found in both clear and dark water lakes and permanent ponds. Plants can also sometimes be found washed up onto shorelines tangled amongst other aquatic vegetation, particularly after water riling events. The majority of Minnesota's known populations occur in the Border Lakes, Laurentian Uplands, and St. Louis Moraines subsections of northeastern Minnesota. Associated plant species include: Lobelia dortmanna (water lobelia), Elatine minima (small waterwort), Ranunculus flammula (spearwort), Juncus pelocarpus (brown-fruited rush), Eriocaulon aquaticum (pipewort), Isoetes spp. (quillworts), Vallisneria americana (eelgrass), Myriophyllum tenellum (slender water milfoil), and Subularia aquatica ssp. americana (awlwort). Littorella americana is a perennial plant often forming colonies by stolons and rhizomes. Flowers are anemophilous, being pollinated by wind. The ovaries are unilocular and produce small nuts. However, fruits are apparently seldom observed in clonal populations suggesting self-incompatibility (Tessene 1968). Plants flower only when exposed by falling water levels. Fluctuating water levels can affect flowering times in a given lake from year to year. Populations range in size from few, scattered individuals to multiple patches with hundreds of plants. The best time to search for flowering L. americana in Minnesota is mid-July to late August. However, the species has been documented from northeastern Minnesota from late June to mid-September. Littorella americana is most often found along stretches or pockets of sandy and gravel shoreline. Such beaches are often preferred places to swim and recreate since shorelines can otherwise be mucky or rocky. Threats to the species include disturbances to its habitat, increased competition from non-native species, and alteration of water levels and water quality from pollution and development. Other disturbances, including the affects of grazing are unknown. The best conservation strategy for L. americana is simply to protect its shoreline habitats and keep them in their natural condition. Several resources and tools regarding shoreland management, including lakescaping and shoreland restoration, are available for landowners and land managers who want to improve water quality at already degraded sites, and some of these strategies could benefit L. americana as well as other aquatic species. Approximately half of the Minnesota populations are located within the Boundary Waters Canoe Area Wilderness. The remaining populations occur in water bodies bound by federal, state, and private ownerships. Continued aquatic survey efforts are ongoing, including botanical surveys in the Border Lakes subsection. It is likely that the use of mask and snorkel could enhance survey success. The Minnesota DNR has developed and made available (online) a number of tools to help with shoreland management and restoration. Hoggard, R. K., P. J. Kores, M. Molvray, G. D. Hoggard, and D. A. Broughton. 2003. Molecular systematics and biogeography of the amphibious genus Littorella (Plantaginaceae). American Journal of Botany 90(3):429-435. Tessene, M. F. 1968. Preliminary reports on the flora of Wisconsin No. 59: Plantaginaceae - plantain family. Transcripts of the Wisconsin Academy of Science, Arts and Letters 56:281-313.